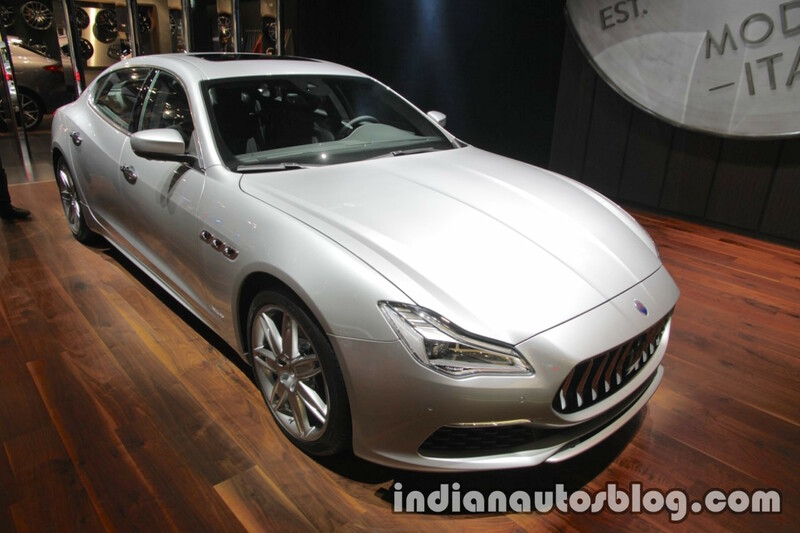 Maserati has showcased its performance car, the 2018 Maserati Quattroporte at the 2017 Frankfurt Motor Show. The 2018 Maserati Quattroporte is 5,262 mm long; 1,948 mm wide, without mirrors and 1,481 mm high. The car gets a 3,171 mm wheelbase. The 2018 iteration features new front and rear bumper design and an Alfieri-inspired, more pointed and imposing front grille with vertical chrome elements, which contrasts with the deep ‘sharknose’ effect. The headlights retain the same profile, but now come with adaptive full-LED technology, replacing the previous Bi-Xenon units. The restyled bumper design features a matt black front profile, rear extractor and side skirts. Beneath the rear bumper, the GTS V8 version can be identified by its twin, trapezoidal, integrated dual pipe exhaust system in chrome-plated stainless steel, while the V6 and diesel models use twin, oval, dual exhaust pipes. On the inside, the standard equipment includes a navigation system and leather, 12-way power comfort front seats with a 4-way electric lumbar support and heating function. The upper dashboard and the armrests are also upholstered in leather. The car gets a high-resolution 8.4” capacitive touch screen, compatible with both Apple CarPlay and Android Auto. The central, lower console features a rotary knob that offers audio volume control as well as the infotainment system’s other functions. Powering the Quattroporte is a choice of 3.0-litre turbo diesel V6 or a 3.0-litre twin turbo petrol or a 3.8-litre twin turbo V8 petrol. The Quattroporte Diesel mill is good for 275 PS and 600 Nm of torque. The Quattroporte’s petrol engine makes 350 PS of power and 500 Nm of torque. The Quattroporte S and SQ4 variants produce 430 PS and 580 Nm from the V6 petrol engine. The Quattroporte GTS features the top-of-the-line V8 petrol engine that generates 650 PS of power and 710 Nm of torque. All versions of the Quattroporte feature the eight-speed ZF automatic transmission and Q4 Intelligent All-Wheel Drive System with mechanical rear Limited-Slip Differential (LSD) as standard. Safety highlights include Integrated Vehicle Control system (IVC); Electric Power Steering (EPS) that enables active ADAS like Highway Assist (HA); Lane Keeping Assist (LKA); Active Blind Spot Assist (ABSA) and Traffic Sign Recognition (TSR).